Due to its location between Speicherstadt and the Kontorhausviertel, the Brooktorkai/Ericus quarter is a particularly popular location for companies. Two of HafenCity’s largest employers – the SPIEGEL publishing house and DNVGL – have their headquarters here. In addition, two private colleges, the Hamburg branches of the International School of Management (ISM) and the Frankfurt School, are training tomorrow’s business experts in the immediate vicinity. 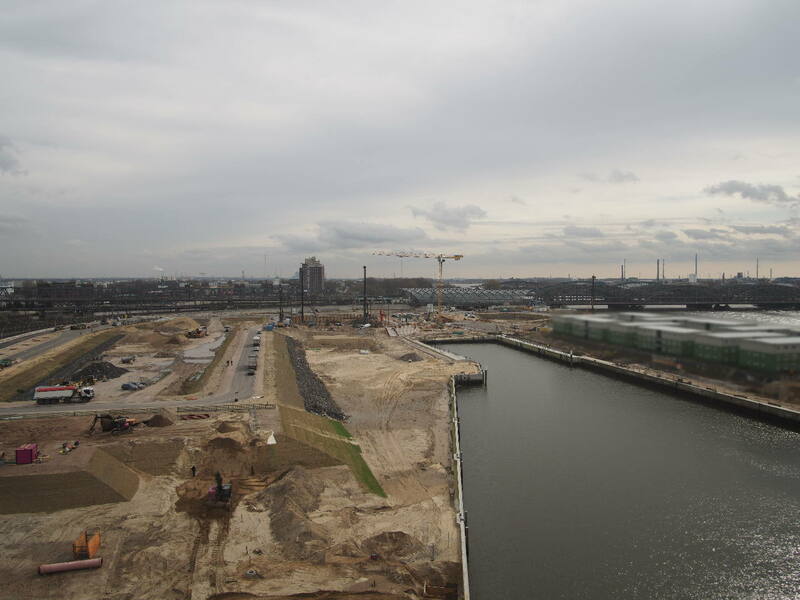 The buildings (35-38) of the northeastern HafenCity entrance emulate the form of a meandering stream bubbling astride the Brooktorkai, after which the buildings are named. Their material, color, and height mirror that of the red brick structures in the historic Speicherstadt located opposite the development. Unlike the rest of HafenCity, this area features fewer residential spaces. One of the three small towers of the Brooktorhafen ensemble contains the quarter’s 30 apartments, which feature an impressive view of the Lohsepark. The north-east gateway to HafenCity, Ericusspitze, is defined to a great extent by the SPIEGEL Group publishing house and the Ericus Contor. In September 2011, the publishing house merged its entrepreneurial activities in a new construction built according to plans drawn up by Henning Larsen Architects (Copenhagen). This building was certified gold with the HafenCity Ecolabel in 2012. The concept not only establishes a close resemblance to the Speicherstadt, but also to other dominant urban structures of HafenCity. In addition to the Elbphilharmonie in the west, which has already been built, this includes the Elbtower at the eastern end of HafenCity. Together they form the outer urban triangle of the entire area, with the SPIEGEL building serving as the dominant structure in the entrance to HafenCity as viewed from the perspective of the main train station. The Hamburg-based landscape architects WES & Partner were responsible for designing the open spaces at Brooktorkai and Ericusspitze. Their plans featured a 30-m long ‘stone sofa’ which offers views of the harbor basin. A spacious amphitheater at Ericusspitze acts as a transitional element between levels. Pedestrians reach the plaza with a spectacular view of Ericusgraben, Oberhafen, and Lohsepark via step seats and pathways.